New Delhi, September 11: The Indian Air Force on Monday achieved a milestone as it has successfully carried out refuelling of indigenously developed light combat aircraft Tejas. Notably, the first ever mid-air refuelling of the indigenously developed light combat aircraft Tejas was successfully carried out, placing India in an elite group of countries having air-to-air refuelling system for military planes. In a press release, Hindustan Aeronautics Ltd (HAL) said that the milestone was achieved at 9.30 am when 1,900 kg of fuel was transferred from the mid-air refuelling tanker of IAF’s IL78 to the Tejas LSP8 at an altitude of 20,000 feet. 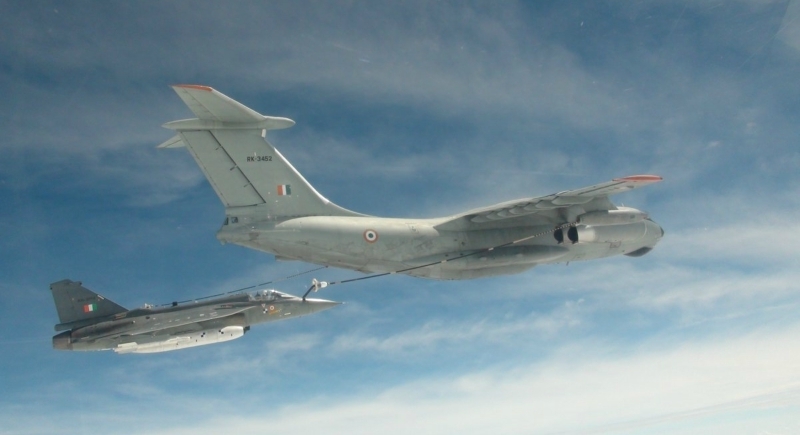 The successful trial comes a week after the Indian Air Force (IAF) successfully did a dry run of mid-air refuelling using the Russian-built IL-78 MKI tanker. Before this ‘wet contact’ trial, the ‘dry contact trials’ were successfully conducted on September 4 and 6 this year where the Drogue (basket) extended from the IAF tanker aircraft by a fuel hose, was tracked and plugged into using the aircraft refuelling probe without taking fuel. IAF provided all required support to DRDO including the tanker aircraft for the successful test flight. “The Light Combat Aircraft (Tejas LSP8) has successfully completed the wet (actual) engagement today by transferring 1,900 kg fuel from IAF IL78 mid-air refuelling tanker,” HAL added. Raksha Mantri Nirmala Sitharaman has complimented DRDO-ADA, IAF, HAL and other agencies involved in the mission. The enhanced range and endurance in air are expected to provide IAF a host of options in exploiting the operational potential of the LCA as well as to participate in international exercises without having to stage through several locations enroute.